In this article, we will provide 4 solutions to help you recover deleted PSD files and 3 methods to recover corrupted PSD files. Keep reading it and get PSD files back. What would you do if the Adobe Photoshop project that you've been working on for the past one-week just vanishes in thin air without warning? Disappointment and dismay will of course follow suit. Photoshop Document, simply referred to as a PSD file, is what stores edited images together with other imaging options in Photoshop. Similarly, Photoshop is ideal for image editing purposes and can also be used for simple video editing. Such files are stored with .PSD file extension. It is in the event when these files get deleted or accidentally formatted that you'll need to perform a PSD recovery. This post provides you the best photo file recovery software that you can use to recover any deleted/corrupted PSD files in simple steps. Therefore, to perform a PSD recovery faster, just download the best PSD recovery software below and follow the steps to recover your deleted PSD files without hesitation. Part 1. How to Recover Deleted PSD Files? Part 2. How to Recover Corrupted PSD Files? If you have deleted your PSD file and want to get them back now, don't worry, there are tricks you can use to help recover your files. Let's have a sneak peek on how to recover deleted Photoshop files with 4 useful methods. Probably the best option is to use the reliable Recoverit PSD recovery software to salvage your PSD files. Once installed, the software is able to recover deleted Photoshop files with only a few clicks. This tool is the bomb as it not only walks you the paths of how to recover PSD file, but enables you to recover lost data for free with its free trial. Recover lost or deleted PSD files from any storage device effectively, safely and completely. Supports PSD files recovery from computer recycle bin, hard drives, and even external devices like memory card, flash drive, digital camera and camcorders. You can watch the one-minute video and get a complete tutorial on recovering PSD file with Recoverit PSD Recovery. If you happen to lose your PSD files and are now in a state of panic, just relax. These steps will show you how to recover deleted PSD files in simple mode after you download and install the best Recoverit PSD recovery. Here we take Recoverit PSD Recovery for Windows as an example to show steps, Mac users can use Recoverit for Mac and turn to this guide: Recover Files from Mac. 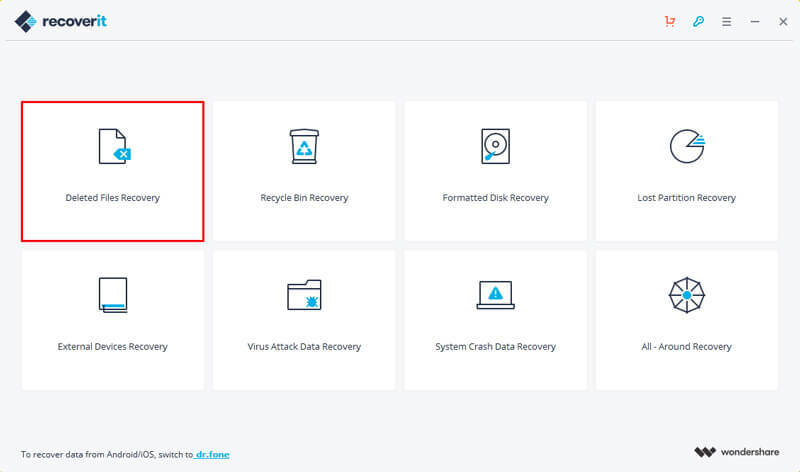 Once you launch the data recovery software, you have the option to select an action depending on your data loss scenario. Here click on "Deleted Files Recovery" option and you'll be redirected to the hard disk drive options. Depending on whether you saved your data on Disk (C) or Disk (D), select the disk from where to get the data. 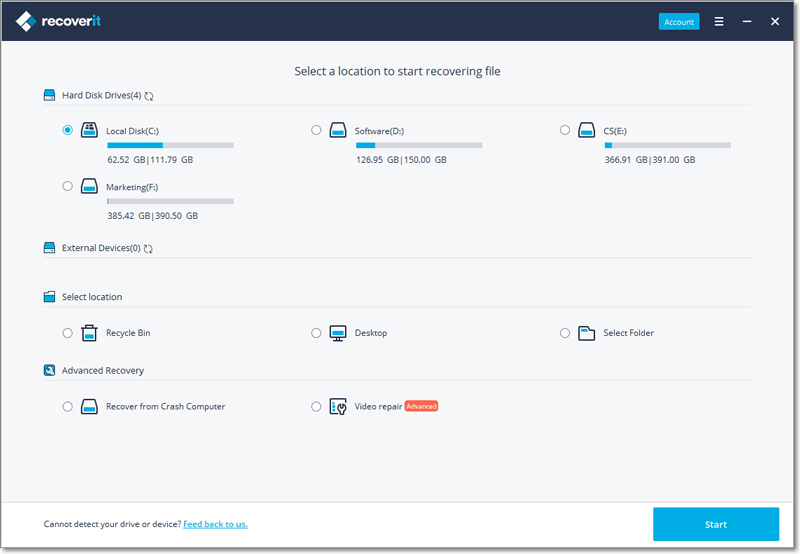 Recoverit PSD file recovery software will then let you do a scan once you select the drive. Select one hard disk drive, then click on "Start" button found at the bottom right of the screen. This will enable the scan process to begin. Once it is completed, click on "OK" button and be taken to all file types that are retrievable. You'll be able to have a glimpse of all the PSD files. So, you are able to select and recover corrupted PSD file or that which was accidentally deleted. Check in all the files you need to recover, then click on 'Recover' button. Note: Once the recovery is completed, do not save your recovered files in their place of origin. Rather, save them in a different location or better still, an external disk like a flash drive. It is possible to do a PSD recovery for free from your PSD file backup. However, this is only possible if you had backed up your files earlier before the loss. You can save your backup files on other locations or your external storage devices. Besides, the Windows backup utility can also help us to backup PSD files. There could be shadow copies of your files created by Windows. It can be stored as restore points. You just need to enable the feature. 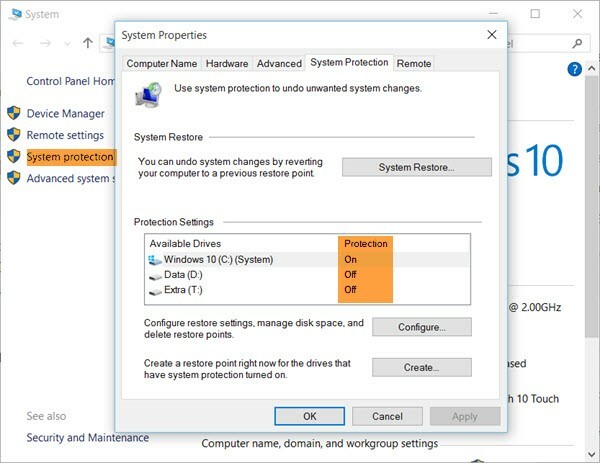 Check on a drop down menu and pick on Protection settings. This should be set to ON. 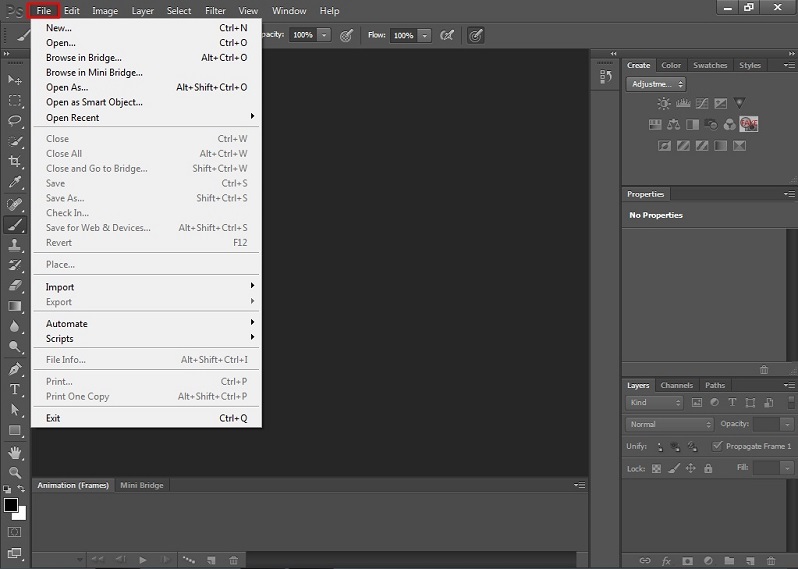 Click on Create to create restore point, and then click on OKto restore your PSD files back. In the event that you have just experienced a crash and then realize that you haven't saved your PSD files, this is the option for you. Simply recover PSD file after crash by following these steps. From the drop down menu, chose Open recent. This will show you all your recently opened files. Pick on the respective PSD file and click on it to restore it back. The third option is to recover your data from temp files. Simply follow these steps and get hands on how to recover PSD file from temp. Since all files are saved on the hard drive, click to open your Hard drive. None of the latter 3 methods work at all? Turn to Method 1 and use Recoverit PSD Recovery to get deleted PSD file back. Have you lost Photoshop images or are you having trouble accessing them and wondering how to recover a corrupted PSD file? Take a look at these means and you'll be amazed how easy it is to do a quick PSD recovery. Save the restored PSD file with a dot PSD extension. This will enable you to work in .PSD mode as the file has now been repaired. Photoshop has got an Auto save feature that lets you easily recover PSD file in an event that your file suddenly corrupts. Unlike the PSD recovery online that requires you to be on the internet, the Auto save is enabled by default the moment you install Photoshop software. To recover your corrupt file, run Photoshop and click on "File" from the task bar. From the drop down menu, pick on "Preferences" > "File Handling". 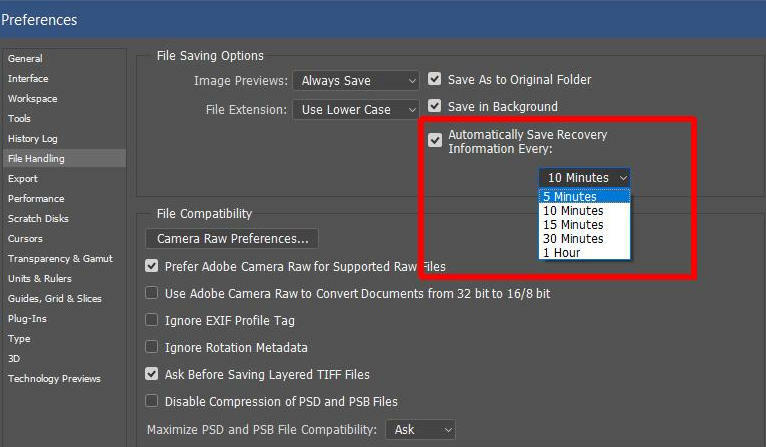 Go to "File Saving Options" and enable the "Automatically save recovered information every"
Photoshop will continually save your PSD file after every selected minute's duration. If you can't see the files due to the saved or backup files are hidden, you can go under View/Options in the File Explorer, turn on show hidden files in the tab named View. Accidental deletion is a common phenomenon to lose PSD files. Learn to save your work as you move along with editing. In most cases, it will catch you unaware as you try to free some disk space or remove duplicates. However sickening, you can look into ways to recover deleted PSD files and get your files back. Drive formatting, if not done properly, may pose you to PSD file damage. It is ideal to format one partition at a time, keeping in mind that files become invisible after a format. A system crash or sudden power outages are the key causes of such corruption. This is where power backups can save you tons of worries. However, it is also possible to do a recovery, although it may have inconvenienced you to some extent. Maybe the partition you've just deleted is what contains your PSD files. Once you confirm that click button, you would have wiped all files. You can act smart and back up your files, otherwise you'll need to recover your PSD file to restore them back. 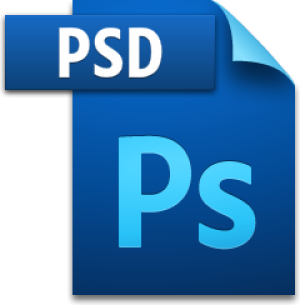 PSD is the default style that Photoshop uses to save data. PSD is an accepted file format that supports numerous image modes such as duo tone, RGB, grayscale, bitmap, multichannel and more. PSD's unique feature is that it allows you to work with any image individual layer. However, you ought to flatten this layer once an image is complete. Flattening the layers enables the files to be converted to other formats like .GIF, .TIFF and .JPG. It is these formats that are easily shared as compared to .PSD formats. Remember that once you have converted the .PSD files to the shareable formats, you can no longer convert them back to .PSD. This therefore means that you can no longer work with the layers as before. To be on the safe side, always save any .PSD format during conversion to prevent accidentally deleting Photoshop file or even more, overwriting your file. If you lost or accidentally deleted photos in other image file formats, you can check out the guides for photo recovery. To round it up, PSD files go through a tedious process to be vanished. It can therefore be heartbreaking to suddenly lose a project that has taken you lots of hours to construct. This is where the benefit of PSD recovery online comes in. But what if your internet connection is also not responding for an urgent remedy? Opt for the all photos recovery software. Recoverit Data Recovery is simple to use with a detailed step by step guide to help you along the way. Use this free software to recover your corrupted PSD file just in time.